OOOOOOHHHHH my goodness! If you haven’t been to Borusso’s in Kenilworth, Cape Town you are missing out on a taste sensation, not to mention one of the coolest restaurants in the burbs. Borusso’s makes the BEST pizza in town as far as I’m concerned. I’m not sure if it’s because of the awesome and generous pizza’s and pasta’s they make, pizzas are woodfired – of course. Or if it’s because of the totally radical vibe that they have. I’ve been going to Borusso’s for years and years and it’s one of the first places I think of when I want a chilled dinner with friends. This was exactly it on Saturday night, plus dinner for two turned into dinner of five friends! Woohoooo. What I love about Borusso’s is that they don’t do bookings – first come first serve and when it’s busy you’ll see queues of people, which just says they are ready to wait for good yummy delish food! The tables are close together and there are plenty of them so the wait is well worth it. We got there after 20h00 so we easily got a table. The service is chilled, but attentive, they are rather happy to let you natter on with your mates and don’t bug you to place an order. I’d suggest always getting a garlic and feta bread to share for the table (no matter what size – equally delish for 2 people …). Normally I have the Porcapeppa Special (bacon, feta, peppadews and caramalised onion) and then I add avo. One a side note Borusso’s has the MOST generous avo portions, often you add extra avo and it feels like you’ve only got half of a quarter for an extra 16 bucks (rip off much), but not Borusso’s. Here you get what seems like an entire avo if not more. Well worth it. This time my friends convinced me to order something a little different. The No. 1 Special. And oh boy have I got a new favourite. Salami, caramalised onion, chilli (medium) and feta and of course extra avo. YUMMY YUMMY DELISH! This is one of the only places I can smash an entire pizza all by myself. Little Miss Piggy, but oh so worth the cheesy guilt. Do it, do it now. You won’t regret it. 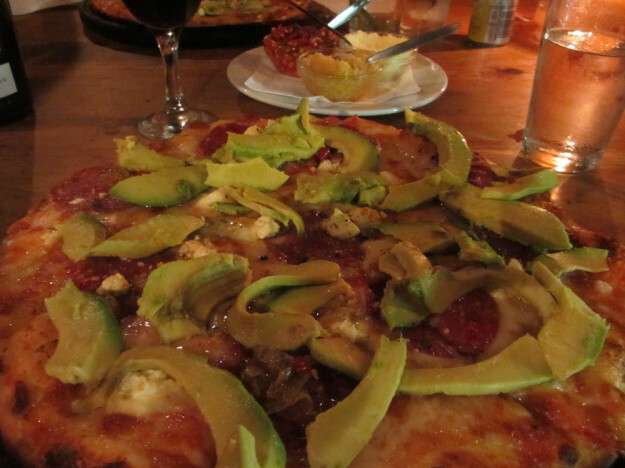 This entry was posted in Eat and tagged best in cape town, borusso's, dinner with friends, pizza. This is such a well written blog! Well done. I think you should tell everyone who reads this to tell Borusso’s that they are there because of your writing. Maybe they can throw in a discount or assure readers that a donation is going in the direction of some worthwhile cause. Eat. Play. Luvving it! Wad.